This building was originally constructed in the late 1920’s as a bank for the Ventura Guarantee and Loan. 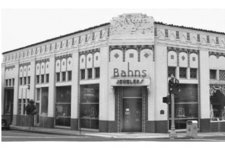 Although it served as a home for many different businesses, it is primarily known as being occupied by the Bahn’s Jewelry Store. Purchased by Theodore Groene in 1961, it was then restored by the contractor, Clyde Campbell. The building features a beautiful interior, including three large murals by Norman Kennedy. The exterior is noteworthy because of the lovely brickwork and the unusual ceramic tiles. The original white paint was removed from the building in 1982.